Please be extra vigilant and make sure your belongings are secure. by Caroline Hall • January 15, 2019 • Comments Off on Please be extra vigilant and make sure your belongings are secure. Two suspicious vehicles have been spotted on CCTV cameras at Oulton Park. One vehicle was a Graphite Grey VW Transporter the other was a Graphite Grey Mitsubishi 4 x 4. Unfortunately no registration numbers were noted. If you see these vehicles please report details to the police on 101. 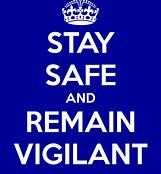 Please be extra vigilant about securing buildings, sheds, vehicles, livestock, pets etc.